I'm slowly making my way through a ton of apples that my grandparents gave us. Here's a recipe that I adapted from Taste of Home. The orange juice adds depth to the flavor of the dish. I increased the size of the recipe and decided to take a short cut and use Bisquick. I'm all about short cuts! If you prefer not to use the short cut, just follow the original recipe, substituting shortening for the butter and rice milk for the milk. In a large bowl, combine the sugar, cornstarch, cinnamon and nutmeg. Add apples and orange juice; toss to coat. Transfer to an 9-in. x 13-in. baking dish coated with cooking spray. For topping, mix together the baking mix, sugar, margarine and rice milk. Drop mounds of the mixture on top of the apples. 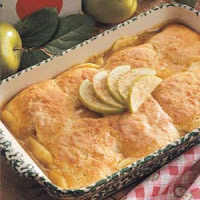 Bake at 375° for 40-45 minutes, or until topping is golden brown and apple mixture is bubbly. Doesn't Bisquik have buttermilk in it? Nope. Bisquick is dairy-free. Some of the store brands, however, are not, so double check those ingredients!